If you’ve seen the excellent BBC/Science Channel series “Wonders of the Universe,” you know that host Brian Cox’s natural enthusiasm for astronomy is nothing short of infectious. His explanations of far-out concepts bring the mysteries of our Universe down to Earth for everyone to understand… and now he and HarperCollins UK have brought them even closer — right to your iPad. Now, here on Universe Today you can win a free copy of the app as well as a signed copy of his Wonders of the Universe or Wonders of the Solar System hardcover book! Brian Cox’s Wonders of the Universe is designed for people with any level of understanding of astronomy, from casual explorers interested in the aesthetics to those looking for a deeper educational experience. Users can travel with Professor Brian Cox on his personal tours through the Universe, or jet off on a solo voyage of discovery through the planets of the Solar System to local stars and onwards through the galaxy. Additionally, the app takes full advantage of the extensive capabilities of the new iPad, using a powerful 3D engine capable of handling high-resolution textures and complex animations created exclusively for iOS5. Watch a personal tour of the app given by Prof. Brian Cox above. Brian Cox’s Wonders of the Universe is available on the iTunes store now for an introductory price of $6.99 USD… or you can enter for a chance to win a free download along with a signed copy of a Wonders of the Universe or Wonders of the Solar System hardcover book (four of each are available!) by emailing [email protected] with subject line “Wonders App”. Be sure to put your mailing address in the body of the email, and we will randomly select 8 winners to receive a signed book (our discretion) and a download code for the app. The contest is open to all U.S. residents. One winner per mailing address. Please allow 2-3 weeks for delivery of the books. Winners will be chosen by June 10, 2012. These are beautiful books that are chock full of information about our Universe as well as signed by Brian Cox himself… don’t miss out on a chance to get one! Also, be sure to check out the latest app from HarperCollins UK, Fragile Earth. It uses amazing satellite imagery from all across the planet to put a century of climate change at your fingertips. It’s currently available from the iTunes store for $2.99 USD. Professor Brian Cox is the Chair in Particle Physics at the University of Manchester, and works on the ATLAS experiment (A Toroidal LHC ApparatuS) at the Large Hadron Collider at CERN. But he’s also active in the popularization of science, specifically with his new television series and companion book, Wonders of the Universe. Universe Today had the chance to talk with Cox, and on Tuesday he told us about the recent advances in particle physics, and on Wednesday we asked him about his favorite space missions and his hopes for the future of science. Today, Cox tells us about his role in sharing science with the public, and talks about his new book and filming the television series. For a chance to win a copy of the “Wonders of the Universe” book, see our contest post. Universe Today: You’ve been really busy, with writing books, filming two television series and DVDs. Do you have time to do research in particle physics as well? Brian Cox: Well, I must say I’ve been a bit restricted over the past couple of years in how much research I’ve done. I’m still attached to the experiment at CERN, but it’s just one of those things! In many ways it’s a regret because I would love to be there full time at the moment because it is so genuinely exciting. We’re making serious progress and we’re going to discover something like the Higgs particle, I would guess, within the next 12 months. But then again, you can’t do everything and it’s a common regret amongst academics, actually, that that as they get older, they get taken away from the cutting-edge of research if they’re not careful! But I suppose it is not a bad way to be taken away from the cutting edge, to make TV programs and push this agenda that I have to make science more relevant and popular. UT : Absolutely! Outreach and educating the public is very important, especially in the area of research you are in. I would guess a majority of the general public are not exceptionally well-versed in particle physics. Cox: Well, Carl Sagan is a great hero of mine and he used to say it is really about teaching people the scientific method – or actually providing the understanding and appreciation of what science is. We look at these questions, such as what happened just after the Universe began, or why the particles in the Universe have mass – they are very esoteric questions. But the fact that we’ve been able build some reasonable theories about the how old universe is — and we have a number 13.73 ± 0.12 billion years old, quite a precise number — so the question of showing how you get to those quite remarkable conclusions is very important. When you look at what we might call more socially-important subjects – for example how to respond to global warming, or what should be our policy for vaccinating the population against disease, or how should we produce energy in the future, and if you understand what the scientific method is and that it is apolitical and a-religious and it is a-everything and there is no agenda there, and is just pure way of looking of universe, that’s the important thing for society to understand. “Wonders of the Universe” is a book about the television series. Traditionally these books are quite ‘coffee table,’ image-heavy books. The filming of the series took longer than we anticipated, so actually the book got written relatively quickly because I had time to sit down and really just write about the physics. Although it is tied with the television series, it does go quite a lot deeper in many areas. I’m quite pleased about that. So it’s more than just snapshots of my view of the physics of the TV series. I should say also, some parts of it are in the form of a diary of what it was like filming the TV series. There are always some things you do and places you go that have quite an impact on you. And I tend to take a lot of pictures so many of the photographs in the book are mine. So, it is written on two levels: It is a much deeper view of the physics of the television series, but secondly it is a diary of the experience of filming the series and going to those places. Cox: One thing that, well, I wouldn’t say enjoyed filming, because it was quite nerve-wracking – but something that really worked was the prison demolition sequence in Rio. We used it as an analog for a collapsing star, a star at the end of its life that has run out of fuel and it collapses under its own gravity. It does that in a matter of seconds, on the same timescale as a building collapses when you detonate it. Wandering around a building that is full of live dynamite and explosives is not very relaxing! It was all wired up and ready to go. But when we blew it up, and I thought it really worked well, and I enjoyed it a lot, actually as a television piece. The ambition of the series is to try and get away from using too many graphics, if possible. You obviously have to use some graphics because we are talking about quite esoteric concepts, but we tried to put these things ‘on Earth’, by using real physical things to talk about the processes. What we did, we went inwards into the prison and at each layer we said, here’s where the hydrogen fuses to helium, and here’s the shell where helium goes to carbon and oxygen, and another shell all the way down to iron at the center of the stars. That’s the way stars are built, so we used this layered prison to illustrate that and then collapse it. That’s a good example of what the ambition of the series was. UT : You’ve been called a rock star in the physics and astronomy field but in actuality you did play in a rock band before returning to science. What prompted that shift in your career? Cox: I always wanted to be a physicist or astronomer from as far back as I can remember, that was always my thing when I was growing up. I got distracted when I was in my teens, or interested I should say, in music and being in a band. The opportunity came to join a band that was formed by an ex-member of Thin Lizard, a big rock band in the UK, and the States as well, so I did that. We made two albums; we toured with lots of people. That band split up and I went to university and then joined another band as a side line, and that band got successful as well. That was two accidents, really! It was a temporary detour rather than a switch, because I always wanted to do physics. UT : Thanks for taking the time to talk with us on Universe Today – we appreciate all the work you do in making science more accessible so everyone can better appreciate and understand how it impacts our lives. Cox: Thank you, I appreciate it! This week we’ve been talking with Professor Brian Cox about physics, space exploration and the future. He also talks about all those things in his two television series, Wonders of the Solar System and Wonders of the Universe. Cox has written a companion book to Wonders of the Universe, and thanks to HarperCollins, Universe Today has four copies to give away to our readers! Just send us an email with “Brian Cox Book” in the subject line. Fraser will randomly choose four winners from the emails we receive. The contest ends at 12:00 GMT on Monday, August 22, 2011. This contest is limited to people living in North America and Europe. For more information or to purchase the book see Amazon UK, Amazon US, or HarperCollins. Above, see a sample of the television series. Professor Brian Cox is the Chair in Particle Physics at the University of Manchester, and works on the ATLAS experiment (A Toroidal LHC ApparatuS) at the Large Hadron Collider at CERN. But he’s also active in the popularization of science, specifically with his new television series and companion book, Wonders of the Universe. Universe Today had the chance to talk with Cox, and yesterday he told us about the recent advances in particle physics. Today we ask him about his favorite space missions and his hopes for the future of science. Universe Today: The Juno mission just launched to Jupiter and there are lots of other space missions going on. What are some your favorites and your hopes of what those kinds of missions will discover? Brian Cox: The enormous question for space exploration is origin of life on other worlds. That is currently THE big question. We’ve seen discoveries recently about possible, plausible evidence of flowing water on Mars. There’s been evidence for awhile that there is perhaps subsurface water, but seeing what looks to be the signature of flowing, briny water — today — is very suggestive. On Earth, where we have water we have life, so this new finding makes Mars even more fascinating. The ExoMars project, the joint European-American mission to Mars to look for life is going to be one of most exciting missions yet, because there’s a good chance of finding it. Now we’re heading off to Jupiter, and Europa is actually a fascinating place for the same reason. There is a huge amount subsurface water on Europa, and there has been speculation that colored markings on the surface of Europa could be life. It looks as though there may be seasonal shifts, and that could be possible cyanobacteria in the ice. This is really speculative, but this is the kind of language people are using now, talking about finding life with real optimism. Beyond the solar system, the search for exoplanets is going very, very well. Virtually every star we survey we find planets! Well, that might be a bit of an exaggeration, but we’ve found hundreds and hundreds of planets. We’ve begun to see Earth-like planets and so the next step is to do spectroscopy to look at light passing through the atmospheres of those planets and look for signatures of elements like oxygen. Again, if you find oxygen-rich atmospheres — which we are on the verge of looking for now — if you find that, then you’ve got pretty good evidence there is life on those planets. So, it could be we find life on a distant planet before we find life in the solar system, which would be tremendous. But really, I do think the big discoveries will be all about life, certainly in solar system exploration. UT : What are your hopes for the future regarding physics, technology and space? 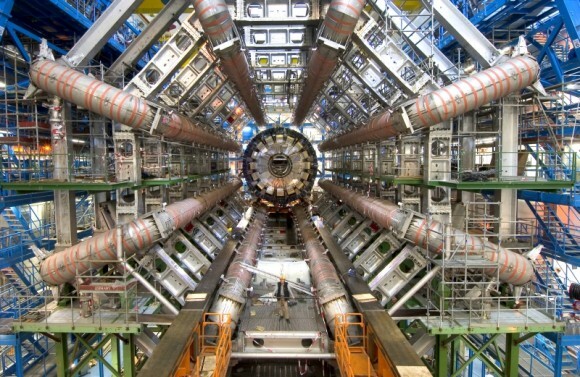 Scientifically, the Large Hadron Collider is going to make a huge difference. It really is going to revolutionize our fundamental understanding of the way the universe works. Then there are these huge questions in fundamental physics, the question of why gravity is so weak, why the universe began in such an ordered way. Then, what is 96% of the Universe made of? We know our Universe is full of something called Dark Matter and we don’t know what it is. The Universe is accelerating in its expansion, which we call Dark Energy and we don’t know what that is either. There is something fundamental going on. I’d like to think this period of time is like the period of 1890 onwards to the turn of the 20th century. There were some small problems with things like understanding the spectrum of light, what atoms were; little problems really. But when we finally understood, it revolutionized our understanding of the Universe. Shortly after the turn of the century we got quantum theory, relativity – a complete change in our understanding. I’d like to think that maybe it’s a bit like that at the moment. There are so many little — and big — chinks in the armor of our picture of the Universe at the fundamental level. I think within the next few years, there will be big shifts, and probably, they will be led by the data from the LHC. At two separate conferences in July, particle physicists announced some provoking news about the Higgs boson, and while the Higgs has not yet been found, physicists are continuing to zero in on the elusive particle. Universe Today had the chance to talk with Professor Brian Cox about these latest findings, and he says that within six to twelve months, physicists should be able to make a definite statement about the existence of the Higgs particle. Cox is the Chair in Particle Physics at the University of Manchester, and works on the ATLAS experiment (A Toroidal LHC ApparatuS) at the Large Hadron Collider at CERN. But he’s also active in the popularization of science, specifically with his new television series and companion book, Wonders of the Universe, a follow up to the 2010 Peabody Award-winning series, Wonders of the Solar System. Universe Today: Can you tell us about your work with ATLAS and its potential for finding things like extra dimensions, the unification of forces or dark matter? Brian Cox, during the filming of one of his television series. Image courtesy Brian Cox. Brian Cox: The big question is the origin and mass of the universe. It is very, very important because it is not an end in itself. It is a fundamental part of Quantum Field Theory, which is our theory of three of the four forces of nature. So if you ask the question on the most basic level of how does the universe work, there are only two pillars of our understanding at the moment. There is Einstein’s Theory of General Relatively, which deals with gravity — the weakest force in the Universe that deals with the shape of space and time and all those things. But everything else – electromagnetism, the way the atomic nuclei works, the way molecules work, chemistry, all that – everything else is what’s called a Quantum Field Theory. Embedded in that is called the Standard Model of particle physics. And embedded in that is this mechanism for generating mass, and it’s just so fundamental. It’s not just kind of an interesting add-on, it’s right in the heart of the way the theory works. So, understanding whether our current picture of the Universe is right — and if there is this thing called the Higgs mechanism or whether there is something else going on — is critical to our progress because it is built into that picture. There are hints in the data recently that maybe that mechanism is right. We have to be careful. It’s not a very scientific thing to say that we have hints. We have these thresholds for scientific discovery, and we have them for a reason, because you get these statistical flukes that appear in the data and when you get more data they go away again. The statement from CERN now is that if they turn out to be more than just fluctuations, really, within six months we should be able to make some definite statement about the existence of the Higgs particle. I think it is very important to emphasize that this is not just a lot of particle physicists looking for particles because that’s their job. It is the fundamental part of our understanding of three of the four forces of nature. Brian Cox at Fermilab. Photo by Paul Olding. UT : So these very interesting results from CERN and the Tevatron at Fermilab giving us hints about the Higgs, could you can talk little bit more about that and your take on the latest findings? COX: The latest results were published in a set of conferences a few weeks ago and they are just under what is called the Three Sigma level. That is the way of assessing how significant the results are. The thing about all quantum theory and particle physics in general, is it is all statistical. If you do this a thousand times, then three times this should happen, and eight times that should happen. So it’s all statistics. As you know if you toss a coin, it can come up heads ten times, there is a probability for that to happen. It doesn’t mean the coin is weighted or there’s something wrong with it. That’s just how statistics is. So there are intriguing hints that they have found something interesting. Both experiments at the Large Hadron Collider, the ATLAS and the Compact Muon Solenoid (CMS) recently reported “excess events” where there were more events than would be expected if the Higgs does not exist. It is about the right mass: we think the Higgs particle should be somewhere between about 120 and 150 gigaelectron volts [GeV—a unit of energy that is also a unit of mass, via E = mc2, where the speed of light, c, is set to a value of one] which is the expected mass range of the Higgs. These hints are around 140, so that’s good, it’s where it should be, and it is behaving in the way that it is predicted to by the theory. The theory also predicts how it should decay away, and what the probability should be, so all the data is that this is consistent with the so-called standard model Higgs. But so far, these events are not consistently significant enough to make the call. It is important that the Tevatron has glimpsed it as well, but that has even a lower significance because that was low energy and not as many collisions there. So you’ve got to be scientific about things. There is a reason we have these barriers. These thresholds are to be cleared to claim discoveries. And we haven’t cleared it yet. But it is fascinating. It’s the first time one of these rumors have been, you know, not just nonsense. It really is a genuine piece of exciting physics. But you have to be scientific about these things. It’s not that we know it is there and we’re just not going to announce it yet. It’s the statistics aren’t here yet to claim the discovery. UT : Well, my next question was going to be, what happens next? But maybe you can’t really answer that because all you can do is keep doing the research! COX: The thing about the Higgs, it is so fundamentally embedded in quantum theory. You’ve got to explore it because it is one thing to see a hint of a new particle, but it’s another thing to understand how that particle behaves. There are lots of different ways the Higgs particles can behave and there are lots of different mechanisms. There is a very popular theory called supersymmetry which also would explain dark matter, one of the great mysteries in astrophysics. There seems to be a lot of extra stuff in the Universe that is not behaving the way that particles of matter that we know of behave, and with five times more “stuff” as what makes up everything we can see in the Universe. We can’t see dark matter, but we see its gravitational influence. There are theories where we have a very strong candidate for that — a new kind of particle called a supersymmetry particles. There are five Higgs particles in them rather than one. So the next question is, if that is a Higgs-like particle that we’ve discovered, then what is it? How does it behave? How does it talk to the other particles? And then there are a huge amount of questions. The Higgs theory as it is now doesn’t explain why the particles have the masses they do. It doesn’t explain why the top quark, which is the heaviest of the fundamental particles, is something like 180 times heavier than the proton. It’s a tiny point-like thing with no size but it’s 180 times the mass of a proton! That is heavier than some of the heaviest atomic nuclei! I think it is correct to say there is a door that needs to be opened that has been closed in our understanding of the Universe for decades. It is so fundamental that we’ve got to open it before we can start answering these further questions, which are equally intriguing but we need this answered first. COX: Well, I think it will – because this is part of THE fundamental theory of the forces of nature. So quantum theory in the past has given us an understanding, for example, of the way semiconductors work, and it underpins our understanding of modern technology, and the way chemistry works, the way that biological systems work – it’s all there. This is the theory that describes it all. I think having a radical shift and deepening in understanding of the basic laws of nature will change the way that physics proceeds in 21st century, without a doubt. It is that fundamental. So, who knows? At every paradigm shift in science, you never really could predict what it was going to do; but the history of science tells you that it did something quite remarkable. There is a famous quote by Alexander Fleming, who discovered penicillin, who said that when he woke up on a certain September morning of 1928, he certainly didn’t expect to revolutionize modern medicine by discovering the world’s first antibiotic. He said that in hindsight, but he just discovered some mold, basically, but there it was. But it was fundamental and that is the thing to emphasize. Some of our theories, you look at them and wonder how we worked them! The answer is mathematically, the same way that Einstein came up with General Relativity, with mathematical predictions. It is remarkable we’ve been able to predict something so fundamental about the way that empty space behaves. We might turn out to be right.